Stab the squash a few times with a knife to let steam escape and bake for about an hour. 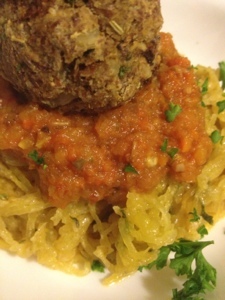 After you cool the squash, slice her open and pull out those noodle beauties, discarding the seeds obviously. In a large sauce pan or something of the sort, melt the coconut oil and sprinkle the garlic salt all up in there. Mix in the squash, basil, and parsley. Get em all coated in the garlic oil and sprinkle in the NoHarm Parm. Cover and cook 2 more minutes. 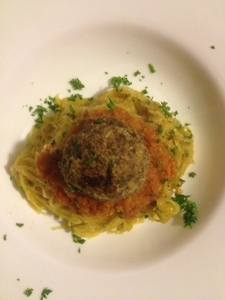 Serve with BandMan's Bomb Spaghetti Sauce and the Mushroom Meatballs below. 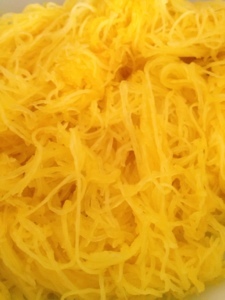 Doesn't this spaghetti squash make your mouth water? 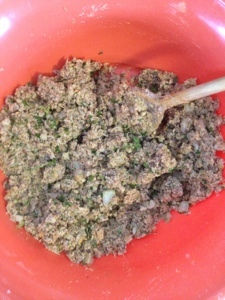 In your food processor pump the onion, garlic, parsley, walnuts, and shrooms until they are all crumbly meaty. Mix in the rest of the ingredients and use your hands to form the mixture into little meatball sized balls and toss on a cookie sheet. Cook for about 15-20 minutes. Turn at some point in the cooking process.